Nicole from Style Me B.A.D. 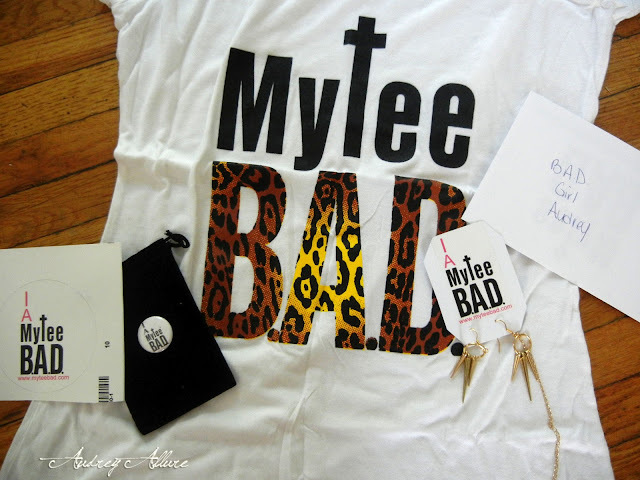 just recently launched her own shop called MyTee B.A.D.. I'm proud to say I'm part of her B.A.D. Girl Network. For those who don't know what B.A.D. stands for, it means Beautiful, Authentic, and Determined. It's an edgy brand dedicated to female empowerment. Plus, portion of the proceeds are given to various local and international charities. As a welcoming into the network, I received the MyTee B.A.D. tee, which is 100% organic and feels incredibly soft! I also received a gorgeous spiked earring necklace. Check out her shop for cute accessories (if you love skulls & spikes, you'll absolutely love her merch). Enter: BGAUD15 at checkout to get a 15% discount! So cute! I love the meaning behind the acronym. Also it's great they give part of the what they sell to charity. Sounds like such a cool brand! The t-shirt look so fun. lovely tee! sounds like a really cool brand, i'm deffo going to check them out! The tee shirt is cute and love the name of the brand. This is amazing! Love the clever name and the beautiful meaning behind it. Definitely checking this out!